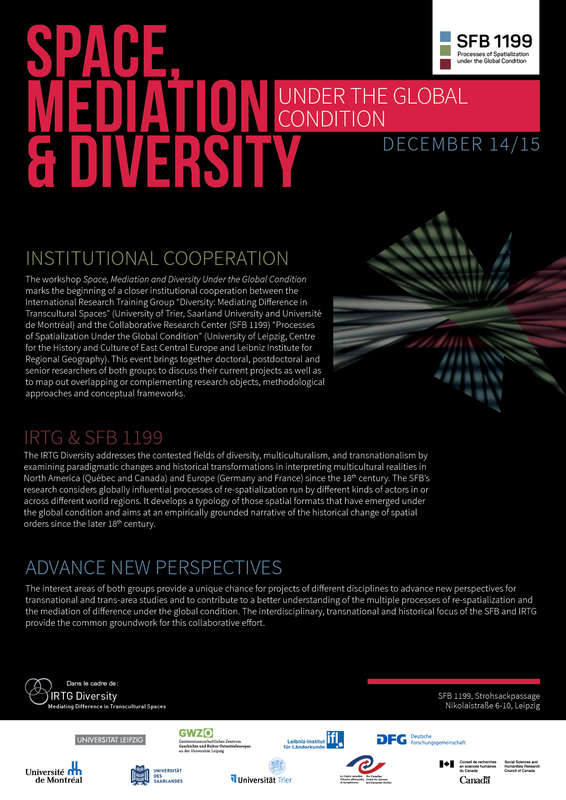 The upcoming workshop Space, Mediation and Diversity Under the Global Condition marks the beginning of a closer institutional cooperation between the International Research Training Group “Diversity: Mediating Difference in Transcultural Spaces” (Trier University, Saarland University and Université de Montréal) and the Collaborative Research Centre (SFB 1199) “Processes of Spatialization Under the Global Condition” (University of Leipzig, Centre for the History and Culture of East Central Europe and Leibniz Institute for Regional Geography). 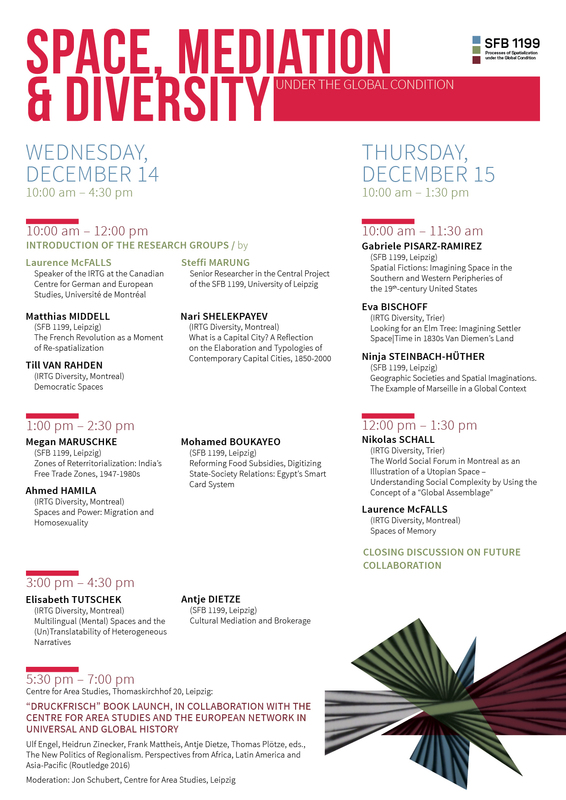 This event brings together doctoral, postdoctoral and senior researchers of both groups to discuss their current projects as well as to map out overlapping or complementing research objects, methodological approaches and conceptual frameworks. The IRTG Diversity addresses the contested fields of diversity, multiculturalism, and transnationalism by examining paradigmatic changes and historical transformations in interpreting multicultural realities in North America (Québec and Canada in particular) and Europe (Germany and France in particular) since the 18th century. The SFB’s research considers globally influential processes of re-spatialization run by different kinds of actors and in or across different world regions. It develops a typology of those spatial formats that have emerged under the global condition and aims at an empirically grounded narrative of the historical change of spatial orders since the later 18th century. 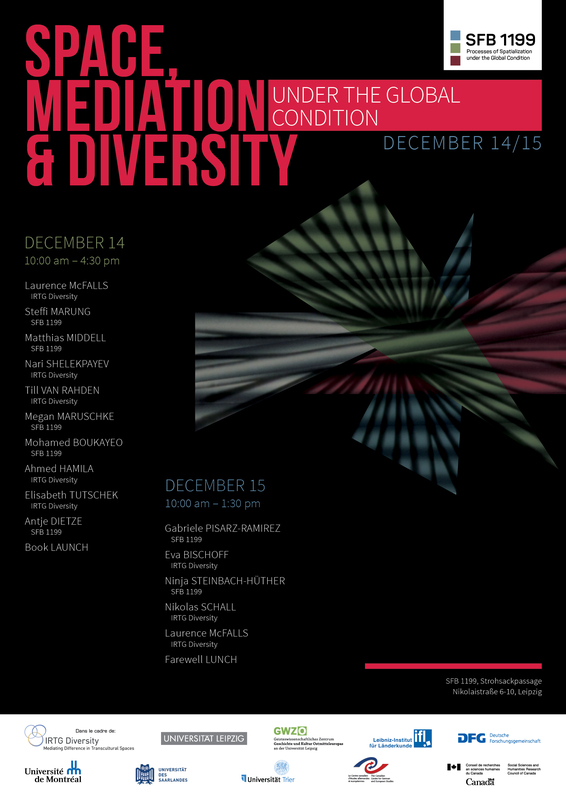 The interest areas of both groups provide a unique chance for projects of different disciplines to advance new perspectives for transnational and trans-area studies and to contribute to a better understanding of the multiple processes of respatialization and the mediation of difference under the global condition. The interdisciplinary, transnational and historical focus of the SFB and IRTG provide the common groundwork for this collaborative effort.